Estimates suggest that today, 70-90 % of Europe’s floodplain area is ecologically degraded because of human activities over the centuries, in particular those taking place since the 1950s. The protection and restoration of floodplains is encouraged by the Water Framework Directive, the Floods Directive, the Habitat and Birds Directives, the EU 2020 Biodiversity Strategy, the Green Infrastructure initiative, and the EU Climate Change Adaptation Strategy, but not explicitly required. Natural water retention measures are cost effective and viable alternatives to structural flood protection. In addition, they support multiple ecosystem functions and services needed to achieve the objectives of several EU policies. Shifting the management focus towards natural retention measures represents a transition towards ecosystem based management and needs to be incorporated into river basin and flood risk management plans, conservation plans and climate change adaptation plans. Restoration requires public support, investment and time. EU and national funding instruments are available to support restoration. Once implemented, natural water retention measures deliver valuable regulating ecosystem services and high quality cultural services. Today, river floodplains in Europe are no longer in their natural condition, largely because of ecological degradation from human activities. Moreover, in parts of Europe, climate change projections suggest high-intensity rainfall will increase, while in others drought could become more frequent, further affecting the condition of floodplains. In either case, improved ecological integrity is becoming increasingly important and natural floodplains will become key to achieving important policy objectives. This briefing provides an overview of the cross-policy benefits of floodplain restoration efforts. Floodplains are an important part of Europe’s natural capital, covering 3-5 % of the continent’s area and 50-60 % of its terrestrial Natura 2000 sites. Because they flood regularly, floodplains are naturally highly fertile areas. This combined with the use of rivers for transport has historically made them ideal sites for human settlement and agriculture. Today, many of Europe’s major cities are located on floodplains and agriculture is linked with around 60 % of land use activities there. While they are home to multiple protected species and habitats, they are also now home to 15 % of Europe’s population; in Austria, the Netherlands, Slovakia and Slovenia this figure rises to more than 25 %. This drive for increased urbanisation and economic growth, and a bigger agricultural area continue to drive change in Europe’s river systems. Public safety from flooding through drainage and flood protection has developed throughout the last centuries, especially after World War II. In addition, Europe’s large rivers are also important transport corridors, supporting trade over large distances. Improvements in navigation have led to rivers being straightened by cutting off meanders and forcing the flow into a fixed channel. These changes have also served as land reclamation projects in which floodplains were drained for greater agricultural production and security of food supply. However, these changes have also made floods more damaging — flood waves became higher and now travel faster down the straightened rivers. They also carry larger amounts of fine sediments creating larger deposits than would have been the case under more natural conditions. Further damage has been introduced through the combined desire for flood control, water supply and hydroelectricity, which increased the development of hydroelectric dams and water storage reservoirs, and the control of water flow in rivers. While these changes have supported both economic growth and flood protection, they have also had serious environmental consequences. The solutions put in place have contributed greatly to disconnecting rivers from their floodplains, greatly reducing their critical roles in flood and drought mitigation, as habitats, and in water quality protection. Estimates made on the Danube, Ebro and Seine rivers and some German rivers suggest that today only 10-30 % of Europe’s floodplains are natural (EEA, 2016). These changes are of such magnitude that many scientists talk of a regime shift for the ecological functioning of many rivers since the introduction of manmade pressures. Moreover, in the future, high-intensity rainfall is anticipated to become more frequent because of climate change, meaning some countries will be faced with an increased demand for flood protection. In other parts of Europe, the frequency of droughts will increase. During droughts, the water stored in natural floodplains mitigates ecosystem impacts. In the recent reporting of the second river basin management plans under the Water Framework Directive (WFD), it is clear that across Europe, Member States are not achieving at least good ecological status for their waterbodies. On average, approximately 40 % of Europe’s surface water bodies achieve good ecological status (EEA, 2018). Similarly, an analysis of the conservation status of 37 floodplain habitats listed in the Habitats Directive shows that the vast majority are in either inadequate or bad conservations status (Figure 1). Across Europe, only 14 % of floodplain habitats and species are in good conservation status. Figure 1. Assessment of 37 floodplain habitats across biogeographic regions. Note: The analysis encompass nine floodplain forest habitats, nine floodplain grassland habitats, and 19 aquatic floodplain habitats. 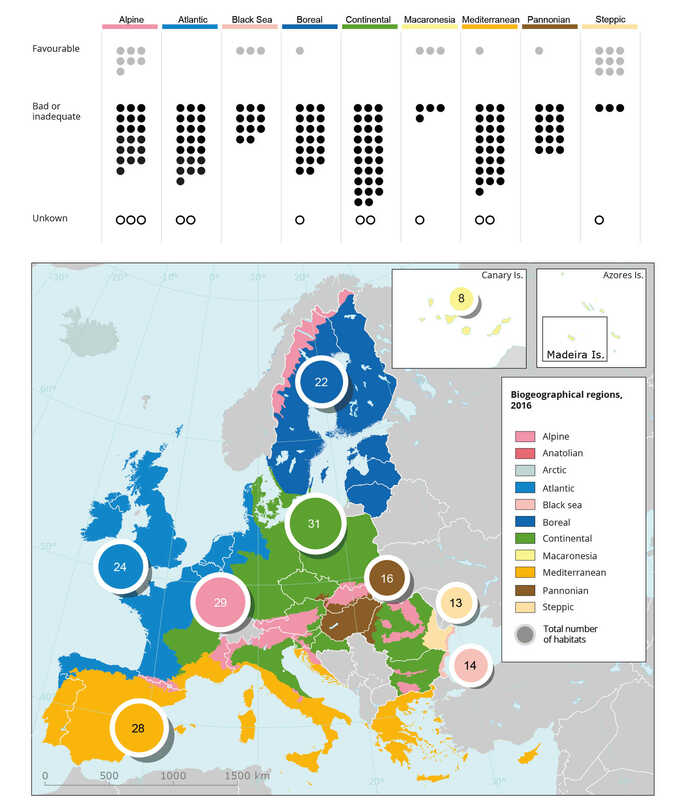 Data aggregated from Eionet – ETC/BD 2015: Online report on Article 17 of the Habitats Directive (2007-2012) of Biogeographic Regions. Although difficult to quantify, there is a link between the amount of natural floodplains and achieving the key objectives of European policies, in particular in the context of the Water Framework Directive, the Floods Directive and the Habitats and Birds Directives. Floodplain management or protection is encouraged but only indirectly required under European environmental policies, but floodplain health is important for achieving multiple European policy objectives. Many of these policies have not reached their objectives to date. Table 1 describes the link between policies and specific regulating ecosystem services that could be provided by a natural, regularly flooded floodplain. These services secure natural flood protection, water purification, nutrient retention and conservation of threatened habitats and species. Table 1: Overview of policies, their needs and the link to ecosystem services provided by a natural, regularly flooded floodplain. Achieving good ecological status in rivers requires absence of hydromorphological and pollution pressures on ecology. They affect around 40 % of water bodies (EEA, 2018). Diffuse nutrient pollution and hydromorphological pressures are reduced where floodplains are more natural. Floodplains support achieving good quantitative status of groundwater. The buffer capacity of floodplains minimises extreme groundwater fluctuations during floods and groundwater reservoirs recharge with flood waters from the river overflowing on to the floodplain. EU Floods Directive (2007/60/EC): Reduce significant flood risk across Europe, also in the light of climate change. Historically, structural measures were used to reduce flood risk. However, because of the changes made to river networks and their floodplains, flood hazard has increased, in part because water moves downstream faster. Structural measures result in hydromorphological pressures. A review of flood risk management plans suggest that nature based solutions that also include natural water retention measures are increasingly becoming accepted. Flood management by allowing more space for water to spread. Increased area of natural floodplains is likely to improve conservation status assessments of listed habitats and species. Floodplains are highly valuable habitats and form an important part of the Natura 2000 network. Several Habitats Directive Annex I habitat types and Annex II species types are found on natural floodplains, as are many birds covered by the Birds Directive. Climate change may increase risk and vulnerability to floods in areas of significant flood risk. Floods may cost lives and are the cause of billions of euros of damage and insurance costs each year in the EU. Climate change may also increase the risk of drought. River and floodplain restoration using ecosystem-based adaptation, natural water retention measures and green infrastructure. Requires that ecosystems and their services are maintained and enhanced by establishing green infrastructure and restoring at least 15 % of degraded ecosystems by 2020. Green infrastructure solutions are important for protecting natural capital. Natural water retention measures are part of Green infrastructure. Note: The colour codes used are red when the objective is not achieved for Europe and yellow when the assessment is not yet complete. Because of the multiple benefits provided by natural floodplains, EU policies encourage restoration based on natural water retention measures, as well as conservation of existing natural floodplains, to be adopted in river basin or flood risk management plans, conservation plans or climate change adaptation plans. Natural water retention measures refer to initiatives where flood protection is provided, while at the same time the natural properties of the floodplain and its connection to the river are restored. As such, these measures are an integral part of ecosystem based management; they can include both structural changes to the river and floodplain, and changes that involve managing land use within the floodplain (Table 2). The European Union promotes the increased use of natural water retention measures as part of its Green Infrastructure initiative and has co-financed restoration projects through the LIFE programme. Examples of ecosystem-based adaptation are available at https://climate-adapt.eea.europa.eu. Using natural water retention measures and green infrastructure can be a cost effective alternative to structural measures (EEA, 2017). Some European Member States are adopting national strategies for better management of floodplains to better access the benefits they provide. It is important to consider the need for restoration in a long term planning process, which supports, for example, river basin and flood risk management plans. In a recent review of flood risk management plans, the European Commission found that most EU Member States plan to use natural water retention measures in future flood risk management activities, at least in a very broad sense. As most restoration projects involve using land differently, it is very important to secure citizen engagement in the planning process and to allow enough time to negotiate the best possible solutions. The results are, however, often greatly appreciated by the public because of the recreational qualities achieved. Órbigo River ecological status improvement. The measures applied in this project aimed to promote floodplain reconnection and restoration, revitalisation of flowing water, levelling of longitudinal barriers, natural bank stabilisation, elimination of riverbank protection to improve the river (lateral and longitudinal) connectivity and dynamics. The project was funded nationally. A 420 hectare grassland dominated agricultural landscape in Lenzen was successfully converted into a natural floodplain area between 2002 and 2011. The relocation of a dike was essential to re-establish natural flooding conditions as a prerequisite for the rehabilitation of floodplain specific animal and plant communities. This has reduced flood risk by around 50 cm upstream of the restored area. The project was nationally funded. The river flow regime was restored by re-meandering the river, thus also restoring the floodplain. A 2.1 km long river stretch was restored by digging and damming the channelled lower stretch of the river Slampe in the Lielupe River Basin District, Latvia. In parallel, a 105 ha hydrological regime was created in floodplain meadows along the river. The project was implemented in 2005 with financial support of the EC LIFE Environment programme. A federal project in Germany to link rivers, canals, natural flood plains, coastal waters and part of the federal waterways into one nationwide biotope system with the aim of securing a properly functioning biotope network. Title: Why should we care about floodplains? Flood risks and environmental vulnerability — Exploring the synergies between floodplain restoration, water policies and thematic policies This report focuses on the role of floodplains in flood protection, water management, nature protection or agriculture and the impact of hydromorphological alterations on the ecosystem services that floodplains provide. The aim is to support the implementation of the EU Floods Directive (EU, 2007), in particular with regard to environmental impacts and how these can be linked to climate change adaptation and disaster risk reduction. It looks at synergies between water management, nature conservation and economic developments both in the field and on policy level. For references, please go to https://www.eea.europa.eu/themes/water/european-waters/why-should-we-care-about-floodplains or scan the QR code.